Kongeniale Verbindung von klassischer und moderner Musik! 1 Il Divo Come What May (Te Amare) (Live In London) (Stereo) - 05:42 Min. 2 Il Divo Dov'e L'Amore (Live In London) - 05:53 Min. 3 Il Divo Adagio (Live In London) - 04:45 Min. 4 Il Divo Nella Fantasia (Live In London) - 04:31 Min. 5 Il Divo La Vida Sin Amor (Live In London) - 05:27 Min. 6 Il Divo Everytime I Look At You (Live In London) - 03:35 Min. 7 Il Divo Passera (Live In London) - 04:54 Min. 8 Il Divo Unchained Melody (Senza Catene) (Live In London) - 03:40 Min. 9 Il Divo My Way (A Mi Manera) (Live In London) - 04:38 Min. 10 Il Divo Wicked Game (Melanconia) (Live In London) - 04:20 Min. 11 Il Divo Si Tu Me Amas (Live In London) - 06:42 Min. 12 Il Divo Mama (Live In London) - 03:24 Min. 13 Il Divo Hallelujah (Live In London) - 04:45 Min. 14 Il Divo Crying (Llorando) (Live In London) - 03:37 Min. 15 Il Divo Unbreak My Heart (Regresa A Mi) (Live In London) - 04:47 Min. 16 Il Divo Without You (Live In London) - 03:41 Min. 17 Il Divo Pour Que Tu M'aimes Encore (Live In London) - 07:38 Min. 18 Il Divo Somewhere (Live In London) - 04:54 Min. 19 Il Divo Time To Say Goodbye (Live In London) - 05:52 Min. 20 Il Divo Senza Parole (End Credits) - 03:55 Min. 21 Il Divo Come What May (Te Amare) (Live In London) (Surround) - 05:42 Min. 22 Il Divo Dov'e L'Amore (Live In London) - 05:53 Min. 23 Il Divo Adagio (Live In London) - 04:45 Min. 24 Il Divo Nella Fantasia (Live In London) - 04:31 Min. 25 Il Divo La Vida Sin Amor (Live In London) - 05:27 Min. 26 Il Divo Everytime I Look At You (Live In London) - 03:35 Min. 27 Il Divo Passera (Live In London) - 04:54 Min. 28 Il Divo Unchained Melody (Senza Catene) (Live In London) - 03:40 Min. 29 Il Divo My Way (A Mi Manera) (Live In London) - 04:38 Min. 30 Il Divo Wicked Game (Melanconia) (Live In London) - 04:20 Min. 31 Il Divo Si Tu Me Amas (Live In London) - 06:42 Min. 32 Il Divo Mama (Live In London) - 03:24 Min. 33 Il Divo Hallelujah (Live In London) - 04:45 Min. 34 Il Divo Crying (Llorando) (Live In London) - 03:37 Min. 35 Il Divo Unbreak My Heart (Regresa A Mi) (Live In London) - 04:47 Min. 36 Il Divo Without You (Live In London) - 03:41 Min. 37 Il Divo Pour Que Tu M'aimes Encore (Live In London) - 07:38 Min. 38 Il Divo Somewhere (Live In London) - 04:54 Min. 39 Il Divo Time To Say Goodbye (Live In London) - 05:52 Min. 40 Il Divo Senza Parole (End Credits) - 03:55 Min. 41 Il Divo Countdown to the Coliseum - 02:43 Min. 42 Il Divo At The Classic Brits - 04:44 Min. 43 Il Divo At The Photoshoot - 03:17 Min. 44 Il Divo In The Studio - 03:49 Min. 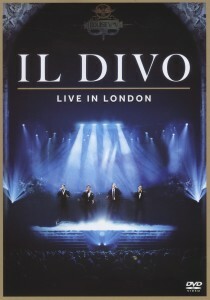 45 Il Divo At The Coliseum - 04:54 Min. 46 Il Divo Wicked Game - Track by Track - 14:21 Min. 47 Il Divo Wicked Game Album Trailer - 02:19 Min.